Democrat Elizabeth Warren officially kicked off her 2020 White House run Saturday with a full-throated pledge to defend working Americans, unbowed by a row over her Native American ancestry that has threatened to nip her campaign in the bud. The Massachusetts senator — who had announced her intention to run on New Year’s Eve — is among the highest-profile of the growing pool of Democrats hoping to unseat President Donald Trump in 2020. The Democratic field is already the party’s most diverse ever — in gender, age and ethnic background — and one of its more progressive. It includes several well-known women lawmakers, with Senator Amy Klobuchar expected to join their numbers on Sunday. Warren’s past battles with Wall Street have brought her a large following, and her campaign team has drawn the grudging respect of its rivals. Hoping to ride the momentum of her Lawrence speech, she heads next to early-voting Iowa and New Hampshire, followed by five other states. Hoping to put the controversy to rest, Warren released DNA tests in October — but this backfired when they showed her to have only negligible amounts of Native blood, dating back generations. Warren ultimately apologized to the Cherokee Nation. Trump’s re-election campaign issued a dismissive statement ahead of Warren’s announcement, saying she had “been exposed as a fraud by the Native Americans she impersonated and disrespected to advance her professional career.” It said her “socialist ideas” would hurt workers. “This is a story that she did not want in this launch,” said John Cluverius, a political science professor at the University of Massachusetts-Lowell. Lawrence, the scene of Warren’s announcement, is a former mill town where a group of women workers, including many immigrants, launched a strike in 1912 that spread across the region and came to be seen as a historic victory for women and for labor, with improved wages and working conditions. The 69-year-old senator has made the protection of middle-class rights the central pillar of her political message. Lawrence, once part of a bustling US textile industry, has for years fallen on hard times, with the loss of thousands of factory jobs. 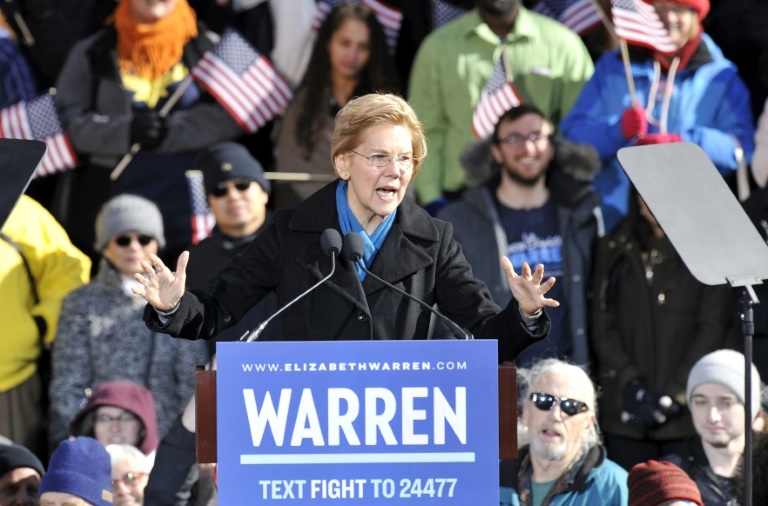 Warren said she would press for steeper taxes on the rich, strong anti-corruption legislation, curbs on lobbyists and a defense of the climate. She also supports universal health care. She pointed to her own rise from humble origins — the daughter of a janitor, she started her schooling in a $50-a-semester community college and ended up teaching law at Harvard — arguing that she can help bring a revival of the American Dream. Cluverius says Warren will need strong Hispanic support since two popular African Americans — Democratic senators Kamala Harris and Cory Booker — are also in the crowded field. She will also need to win over female voters, which might explain the highly unusual — and somewhat risky — decision to include a story about potty-training her baby daughter. Warren recounted her decision to go to law school when Amelia was not quite two years old, but said the only day care she could find — with five days before classes were to start — would take the child only if potty-trained. “Since that day, I’ve never let anyone tell me that anything is ‘too hard,'” she quipped.